A milestone is expected to be reached this fall when minorities outnumber whites among the nation’s public school students for the first time, U.S. Department of Education projections show. 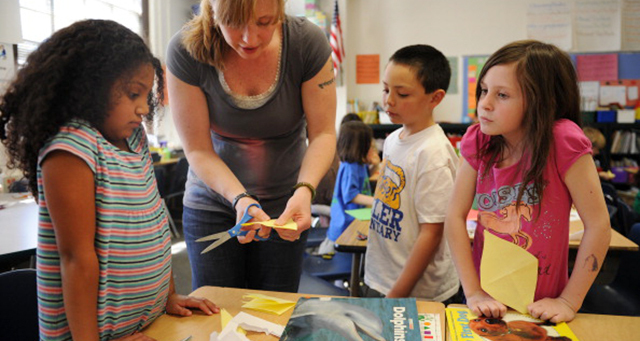 This is due largely to fast growth in the number of Hispanic and Asian school-age children born in the U.S., according to a Pew Research Center analysis of Census Bureau data. A steady demographic change over the years has resulted in a decline in the number of whites in classrooms even as the total number of public school students has increased. 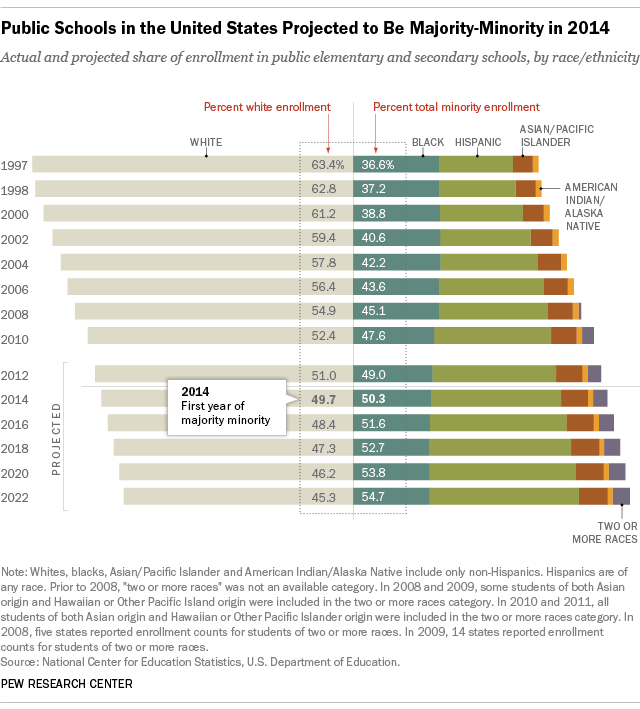 In 1997, the U.S. had 46.1 million public school students, of which 63.4% were white. While whites will still outnumber any single racial or ethnic group this fall, their overall share of the nation’s 50 million public school students is projected to drop to 49.7%. Since 1997, the number of white students has declined by 15%, falling from 29.2 million to 24.9 million in 2014. While the number of white students has declined, there have been large enrollment increases of Hispanics and Asians, two groups that have seen overall population growth. Since 1997, the number of Hispanic students nearly doubled to 12.9 million, and the number of Asians jumped 46% to 2.6 million. The number of black students expected in schools this fall, 7.7 million, has been relatively steady during this time. Most of the growth is driven by U.S.-born Hispanic and Asian children rather than immigrant children. The number of Hispanic and Asian school-age children born in the U.S. has boomed, according to an analysis of Census Bureau data. The difference in growth between U.S.-born and immigrant children is most dramatic among Hispanics. From 1997 to 2013, the number of Hispanic children ages 5 to 17 born in the U.S. jumped 98%, while the group’s immigrant population of the same age declined by 26%. Among Asians of this age, the number of U.S.-born Asians increased 50% during this time, and the immigrant population increased a more modest 9%. Young children are on the leading edge of the demographic shift. Minorities this fall are expected to make up 51% of public school students in grades pre-K through 8th grade and 48% of those in grades 9 through 12. Young Latinos alone accounted for at least 20% of public school kindergartners in 17 states, up from just eight states in 2000. The composition of the private school student population is markedly different. In 2009, about seven-in-ten (73%) of the estimated 4.7 million children enrolled in kindergarten through grade 12 in private schools were white. While those born in the U.S. are driving growth, immigrants are still having an impact in the classroom. Across the country, school districts have had to boost English language instruction for students who are not native speakers. This is because seven-in-ten school-age children who are immigrants or have immigrant parents speak another language other than English at home and will likely be provided English language instruction upon entering school. It’s not certain that minorities will become the majority this fall in the nation’s classrooms because government enrollment data — as opposed to enrollment projections — won’t be available for a few years. Altered projections can throw off landmark demographic moments. This summer, for example, the Census Bureau reversed an estimate from 2012 that declared minority births had exceeded white births in the United States. Due to a sharp decline in U.S. births after the Great Recession, white births today still slightly exceed minority births.